Seeing as tonight is Halloween, not that we celebrate it in Australia, I thought it would be appropriate to have a pumpkin ale. My American beer drinking friend's all rave about pumpkin ales, but this will be the first one I've ever had. Pumpkin ales is, in my mind anyway, the most American of all beer styles out there. Most are brewed around October in the U.S., I am unsure whether this is for Halloween or if pumkins are in season then or something. As for why Gage Roads have produced this beer I have no idea, but it's not going to stop me drinking it! Some of their beers are quite good so I'm intrigued to try this. The pour of this beer is quite similar to a lager. The colour of the beer is a golden colour with quite a lot of orange in it when you hold it up to the light. The head is a slightly off white colour but fades quite quickly down to a ring. The beer doesn't lace the glass at all throughout drinking. Having never seen a pumpkin ale before it's a bit hard for me to judge how this one looks in comparision to others of the same style, however it's not the worlds best looking beer. My first impressions when I smell this beer is that it's a ginger beer. Seriously theres plenty of ginger mixed with cinnamon and nutmeg. There is some sweet fruityness on the nose however it doesn't smell of pumpkin per se. It's just a generic fruity smell. The aroma is quite nice although what this is going to taste like, I have absolutely no idea! Gage Roads have produced one of their strangest beers yet. It's very much like a ginger beer, as the smell indicated, with some sweetish malts and spices upfront before this again strange generic fruit flavour. 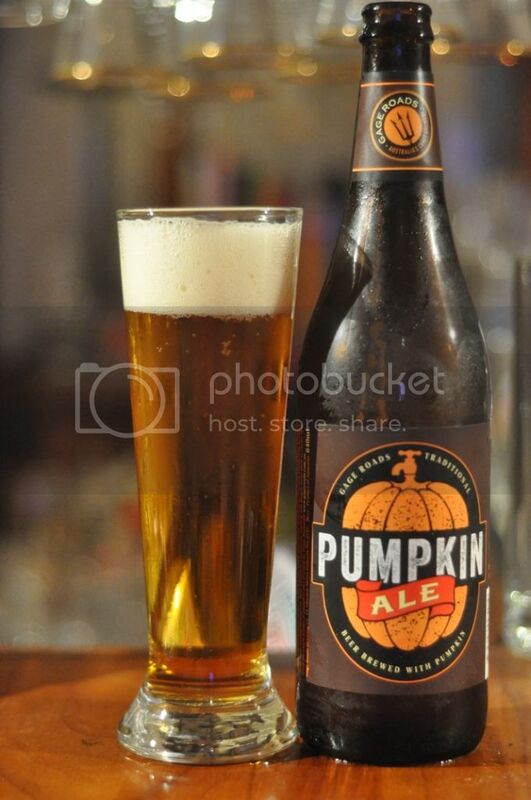 It's not clearly pumpkin but maybe this is the flavour of pumpkin that's been through the brewing process? Anyway the carbonation is quite lively and the mouthfeel is like a lager. It's an eminently drinkable beer. Overall my feeling on Gage Roads Pumkin Ale is that it's a really odd beer. Despite this I actually really enjoyed it as the beer went on and was actually a bit disappointed when the longneck was empty. In my mind it's like a ginger beer crossed with a fruit beer, which doesn't sound good at all but on this hot night is incredibly refreshing. I'm going to buy another couple for summer and see how it holds up on a really hot day. I think it would be a good idea for anyone who likes ginger beers to give this one ago.